I am asked time and again for my fruit cake recipe. More and more brides are choosing to have sponge wedding cakes but many still require a small fruit cake for cutting (Don’t get me started on why you can’t have a small fruit top-tier – just read my wedding cake post!). To make a really good traditional fruit cake, it is essential that you have enough time to allow your cake to mature before it is eaten, at least 6 weeks if not longer. I personally like to get my Christmas cakes made over the October Half Term holiday so that they will be ready for Christmas. 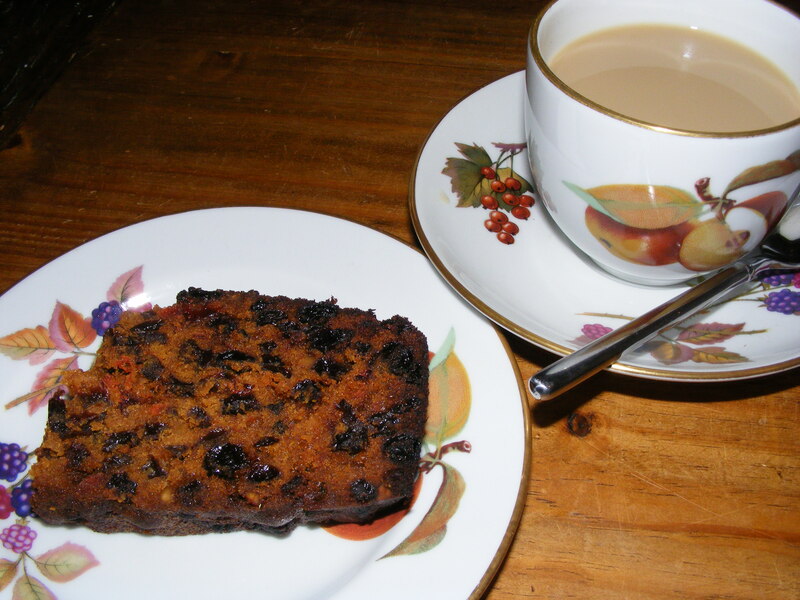 Most fruit cakes contain some form of alcohol. The alcohol of choice is down to personal preference. I always use whiskey because I think it compliments the earthiness of the fruit whilst my best friend swears by brandy and even know someone who uses Armagnac. The alcohol is important because it acts as a natural preservative whilst the cake matures and, of course, adds another flavour dimension. Traditionally the cake was always painted with boiled apricot jam before the marzipan was added but nowadays most bakers prefer to paint the cake with more of the alcohol used in the cake. This “sterilises” the cake surface before the marzipan is applied and so eliminates any potential microbial growth. Boiling the apricot jam is simply not as effective a method. The recipe I use has been in family for years. It belonged to my Great Aunt Olive. She was the most amazing cook! I spent many an hour standing on a chair beside her whilst she made a batch of homemade fudge or mince pies. She didn’t have any children of her own so upon her death I inherited her cook books. This particular recipe came from a dog-eared copy of a now out of print Stork Recipe book. This is one of the few recipes that I have not altered because, in my opinion, it is perfect as it is. If it was good enough for Auntie Ol then it is good enough for me! The following amounts shown will be enough to make an 8 inch cake. Beat in the eggs, treacle and lemon oil. Pour into the prepared tin and bake for 2.5-3 hours. The cake is cooked when a skewer comes out of the cake cleanly. Remove from the tin and place on a cooling rack. Stand the rack over a tray. Stab the cake all over with a skewer then apply alcohol liberally with a pastry brush. I tend to stop when the alcohol starts to drip into the tray under the cake. When completely cold, wrap the cake in greaseproof paper and place in an airtight container. Store for at least 6 weeks. This cake should not need to be “fed” with more alcohol whilst it is maturing but I do paint it liberally with alcohol before I marzipan it.